Check out these ideas for cheap hotels in San Diego. Whether you want a cheap San Diego beach rental, cheap motel in San Diego, or just a budget San Diego CA hotel, or some really cheap places to stay, we have some suggestions for you. If you own a home or vacation home, why not try a home exchange? You can stay for free in a home or vacation home, in exchange for the other party staying for free in your home or vacation home. This is free, so if you are looking for cheap hotels in San Diego, California, you should consider this option. It helps if you own a home in a popular vacation destination. Check out Home Exchange. One cheap way to stay in SD is to bring your own hotel! 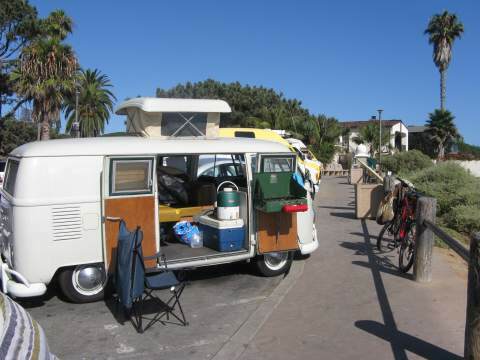 You'll find some surfing dudes who provide their own accommodations, like this row of camping vans at San Diego's famous Swami's surfing beach in Encinitas California. Kitchen and surf board included. Another cheap "hotel" in San Diego is camping in a tent or RV. 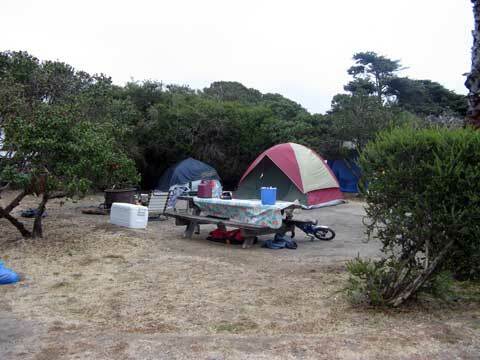 There are a number of inexpensive San Diego beach campgrounds or inland campgrounds in San Diego. Another cheap "hotel" alternative is to stay at a San Diego hostel. A hostel is a low priced accommodation where you rent a bed, sometimes just a bunk bed, in a shared room with other guests. There is typically a kitchen where you can prepare your own food, or meals may be included but you need to help out. Some hostels may have certain restrictions, such as only for non-San Diego students. Hostels are not for everyone, but they are budget friendly! 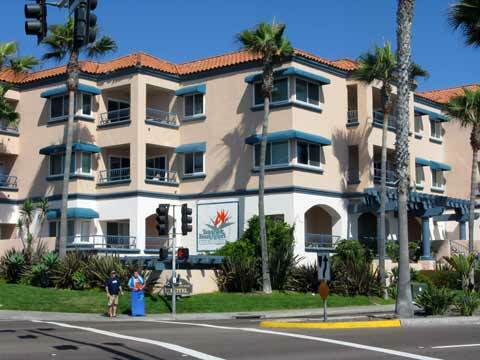 Hostelling International has locations in downtown San Diego and Point Loma. This San Diego hostel offers coed, male, and female dormitory style accommodations, with breakfast. From $19 per night per person. OK, suppose none of those alternatives appeal to you so you really do want to stay in a nice hotel or resort, or vacation rental in San Diego, but at a good price. First, decide where you want to go. Explore some of the pages about San Diego Beaches, North County San Diego Beaches, and San Diego Attractions. Second, choose hotels close to where you want to visit, from the links below. You will usually see some ads for discounted hotel rooms at cheap prices. If you want to visit Disneyland up in Orange County, you might want to stay at a hotel in North San Diego County, so you are more centrally located for your vacation. 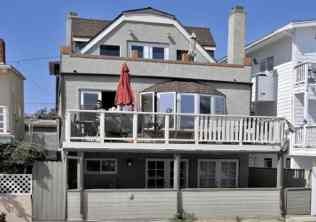 For San Diego Vacation Rentals, click on the link below. Third, if the recommended hotels, which are either San Diego beach front hotels, or hotels with views of the beaches, are too expensive for your budget, then consider cheap hotels in San Diego further inland. You will have to drive a little further, but it will save you money. And since you will be in your car anyway, why not explore different San Diego beaches and adventures each day on your vacation?